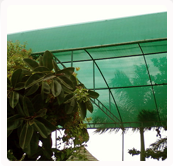 We provide a wide range of UV stabilized shade net for agriculture and horticulture purpose. These nets are generally used in green house. These are specially designed for controlling of excessive heat, wind or hail. These agriculture shade nets assure the adequate sun light for crops and plants. These nets are very useful in protecting crops and at the same time manipulating its growth and growth patterns. Early production of seedling and pre-time harvesting is much easier now with these agriculture and horticulture shade nets. Now, it is not weather but you that control the yield and prosperity. One of the biggest threats to crops is from strong wind that blow and exploit most of the moisture from crop. Shade nets are very useful in protecting crops, plants, budding fruit trees from strong winds. These shade nets create a positive condition for crops and help them to survive. They are also useful for reducing soil erosion, ensuring better seed germination and protecting crops from winds those blown from the sea that contain a high percentage of salt. As Mayura shade nets are U.V stabilized, they are sturdy and durable even in odd weather. These shade nets are very useful in the hilly areas because of less sunlight. We assured complete protection hence our duty doesn’t end by mere protecting your crops and plants. Mayura Shade nets assert complete protection to cattle and poultry house from extreme weather conditions. These shade net save animals from freezing temperature in winter as well as from burning rays in hot weather and proper ventilation is also facilitated. Raisins play a very important role in our day-to-day life and it is also known as a healthiest food. Raisin’s business and its export demand are also very high because of its pros. Mayura shade nets are used for drying up grapes. These shade nets provide adequate weather conditions and protection to dry grapes and turn into raisins. Sericulture is a quite delicate task and needs a lot of care and protection for vermicomposting. Mayura shade nets are very helpful in protecting worms from heat and strong direct rays of sun. Mayura shade nets prove the best protection for your cars as compared to other shade nets because it is designed such that it protects your car not only from heat and wind but also keeps away dust. Using car parking shade nets keep your car newer, and it is economical as compare to other shades. It also gives a neat look to the parking area. Mayura shade net, is lightweight shade net and it is very useful on a construction site for safety purpose. This is made up of high-density polyethylene mono filaments. It can be easily installed on a construction site and work as tri-fold barrier. It reduces falling of debris thus ensures safety of pedestrians and labors of site. It also covers the construction site and keeps building or construction warm during winter season. It also helps to hide unsightly area of construction and gives a neat look. Mayura shade nets can be attached or install around fences to ensure privacy. This blocks unwanted vision and protects your outdoor plants from animals. These shade nets are available in various colors and designs to enhance the appearance. You can also use it to cover harmful equipments or costly tools. If you are missing the shade of a mango tree in your patio in the village during summer, then we bring you a patio and deck shade. This will keep away the burning heat in summer still allow the air where you can enjoy mango pulp. Nowadays, net fabric is widely used for decoration purposes. Mayura knitting fabrics(shade net) with aesthetic design and colours enhance the beauty. These nets are widely used for various purposes like making laundry bags for hotels and homes. These nets are very popular among interior designers for window curtain. Apart from this, interior nets are used for creating a partition in playgrounds, offices or home. You can also use it as balcony cover or garden net for home gardening. Mayura knitting fabric (shade net) allows easy shipment of goods. With its strong grip, it holds the good even in odd shipping circumstances. Collecting fruit from trees will become very easy with Mayura shade net. All you need to do is suspend it under a tree while mechanical shaking operation and collect fruit within minutes. Mayura Shade net keep seeds, seedling and fruits protected from birds. This net does not harm plants and do not resist any natural activity but successfully keeps the birds away. The mesh repels bird without trapping them. The sizes of holes are optimized in a way that keep birds away but allow bees to pass through easily. This net does not prevent light from reaching plants nor does prevent air movement. Air prevention can cause fungus on the fruits but with Mayura shade net, you are no longer bothered about it.